This is what I’ve come to call “Project 8” or just P8. 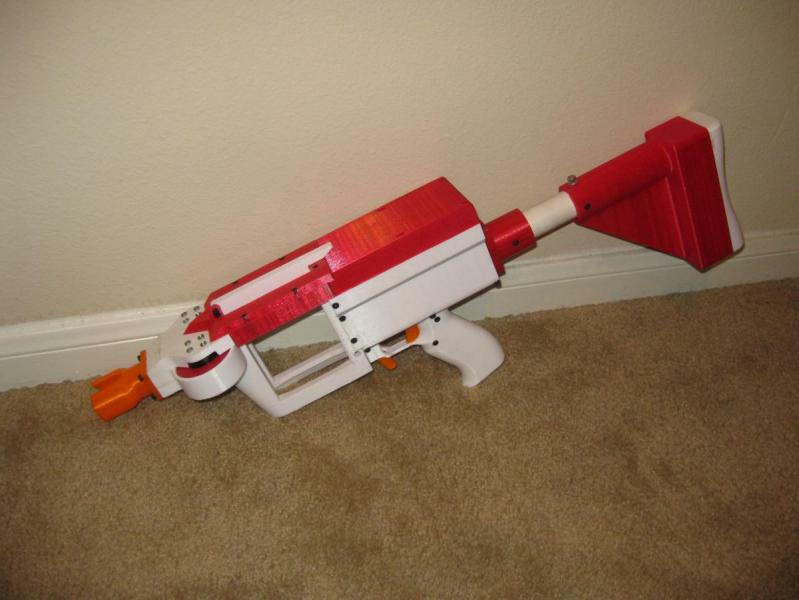 It is a fully 3D-printed, magazine fed, fully-automatic blaster heavily inspired by/based on Torukmakto4’s T19. It uses the same Hy-con geometry wheels, but with the 11mm gap instead of the base 9.5mm. The important parts of the flywheel cage geometry such as spacing and bore diameter are the same, although both parts of the flywheel cage have been modified somewhat. It also uses the same stepper motor bolt drive, although again, some slight geometry changes have been made to fit them into this blaster. Flywheel motor controllers run the same build of SimonK that the T19 does, but with the motor speed governed at 21,291rpm instead of 25,510. The slower speed at the larger gap flywheels are meant for 150fps games, and although there wasn’t a chronograph at the last game, a test cage with the same geometry was getting ~145fps with community bin accufakes and ~150fps with community waffles. The new wheels were printed with different settings that better matched the intended profile, so I dropped the speed by about 5% (to the current speed) just in case it was shooting too hot. The core arduino code is near-stock T19 “Core 26.1”. The only change I made was to reduce the base feed delay from 185ms in non-turbo mode and 180ms in turbo mode to 145ms and 140ms, respectively since the flywheels don’t need to reach quite the same speeds. Essentially this is a T19 in a differently shaped body. I did not really intend this to be so, but once I started doing the CAD, the design took on a life of its own and this is where it ended up. In general it features smoother contours than the T19, especially on the user contact areas, where the grip, the stock pad, and the front of the magwell are all very heavily radiused. It also has large windows on the left and right sides of the magwell so I can see how much ammo I have left in the magazine. The breech is also not a fully enclosed breech like the T19, although the jam door, when closed, serves the same purpose a closed breech does, aligning the dart with the bore. This jam door was really intended to be a top loading door more than a jam door, but I’m not sure I’ll ever actually use it for that. I used to top load my rapidstrike, but it lost that ability about seven months ago and I can’t say I’ve missed it. - It’s pretty large and heavy. Not unreasonably so, but a hypothetical Project 9 may make an effort to be lighter. - The weight balance is a little off. The center of gravity is about an inch behind the handle with the battery in place. Not a huge deal, but noticeable in some circumstances. - The magwell required huge amounts of sanding, filing, and scraping to make the mags drop free. I’ll edit the CAD eventually, but I haven’t yet. - One of the screws in the handle digs into my knuckle if I hold it in certain ways. And so you can see it in action, here’s a video of the CTF rounds we played at the last HANU game where I used this blaster. I'm hoping to integrate T19 tech into the mk16, except that I'll use a solenoid instead of a stepper. I have a working DC-motor semi-auto prototype rig in my garage RIGHT NOW, once I get it sorted and get some spare cash I'll see if I can get the brushless setup going. How well has the solenoid pusher been working for you? I've been reading up on those a bit, looking into a more compact bolt drive, but still have a bunch of questions. They seem smaller than the stepper, but have some problems of their own. lachlan_s's looks smaller than the Aliexpress solenoids, but it looks like it doesn't fail open. I haven't seen enough testing of either of them to know much about reliability or stable cycle rates, and both of them inherently impactful and shaky. At the end of the day, I really doubt there's a perfect solution, just different tradeoffs, as is the case with any engineering project. The stepper may be big and heavy, but damn it's smooth. Definitely do a brushless build when you can. There's so much freedom in the design of the cage and flywheels, and the hy-con system in particular has amazing velocity consistency and is easy on darts. And the sound alone is worth the effort to make one. How well has the solenoid pusher been working for you? Seems pretty good, I had to ask some of the guys who are messing with them more about getting it set up. Maybe. I've got a couple 3d models for them and the solenoid now, but 35mm throw means it's like 120mm overall. Otherwise it's basically 39x39mm. but have some problems of their own. lachlan_s's looks smaller than the Aliexpress solenoids, but it looks like it doesn't fail open. I'll need to try it when I can. I think the hycon with the solenoid pusher would probably be the most awesome solution; after figuring out how to set up the solenoid there's little to go wrong with it - no gears to break or yolk to jam.